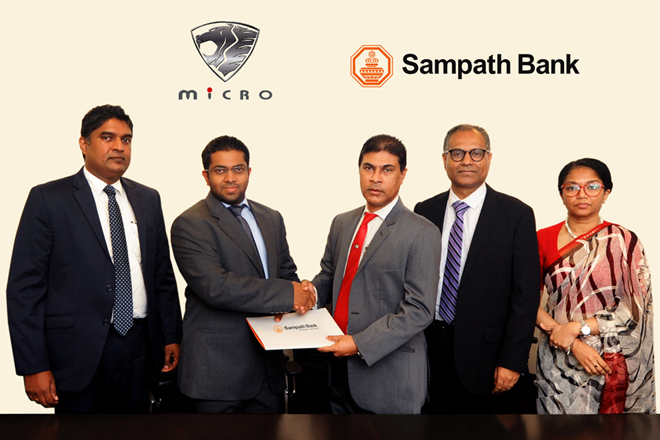 Sampath Bank PLC joined hands with Micro Cars Ltd. to offer special leasing packages on brand new Micro, Geely, BAIC, SsangYong and MG passenger vehicles from 13th December 2018 to 13th March 2019. “We are delighted to join hands with Micro Cars, a company that is equally committed to making owning cars more affordable for our fellow Sri Lankans. This 3 month promotion will see us offering special leasing packages with some of the most attractive interest rates available in the market, together with several other exceptional benefits. We invite consumers to avail these irresistible deals and realise their dream of owning a vehicle,” said Mr. Tharaka Ranwala, Senior Deputy General Manager – Consumer Banking, Sampath Bank PLC. Micro Cars Limited, inaugurated in 1995 as truly a home-grown automobile manufacturer, has grown from strength to strength over the last two decades. Today it has become one of the significant players in the Sri Lankan automobile industry. Having diversified into a group of companies with Transmec International, Micro Construction, Fujitec Lanka, Superlative Properties and EuroSports Auto (franchisee of Lamborghini and many other luxury automobile brands), the company provides employment opportunities to more than one thousand people. Micro Cars operates 11 branches and 48 after sales service centres island-wide. Established in 1987, Sampath Bank has become a state-of-the-art leasing provider that continues to be a market leader today thanks to their constant innovation and customer focused approach to business. Their unique tailor-made solutions, convenience of access and customized payment plans have allowed Sampath Bank to further differentiate themselves from the competition and made them the leasing provider of choice for many in Sri Lanka.